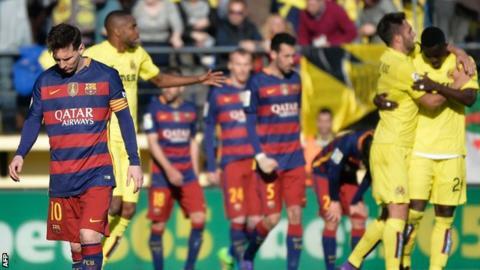 Barcelona stretched their La Liga lead to nine points, despite throwing away a two-goal advantage at Villarreal. Barca moved ahead when Ivan Rakitic fired a low shot past several home defenders, pouncing on a loose ball after Lionel Messi's free-kick. Neymar calmly converted a controversial penalty after he was adjudged to be fouled by home keeper Sergio Asenjo. But fourth-placed Villarreal fought back through Cedric Bakambu's neat finish and Jeremy Mathieu's own goal. Barca, who saw nearest rivals Atletico Madrid suffer a shock loss at Sporting Gijon on Saturday, had to settle for a point as they extended their Spanish record unbeaten run to 39 matches in all competitions. The Catalan side are 10 points ahead of third-placed Real Madrid, who thrashed Sevilla 4-0 later on Sunday. Villarreal look unlikely to pip Madrid to an automatic Champions League place, but are well equipped to reach the competition's qualifying round after a deserved point against the reigning champions. They are 12 points adrift of Zinedine Zidane's side, but have a six-point cushion over fifth-placed Celta Vigo. Both home goals came after Barca boss Luis Enrique reshuffled his defence with the introduction of Mathieu, who replaced the booked Gerard Pique, and right-back Dani Alves. The visitors appeared vulnerable to further punishment, but regained their composure to see out the final half hour. However, there were few chances for either side to nick an action-packed game, which saw referee Jose Sanchez infuriate the home crowd with a series of bizarre decisions. "The best teams in the league have lost here, we've drawn. We were close to winning, but also could have lost. "It is a positive round of fixtures for us. One less to go and one point closer to our objectives. "It is a positive result for us." Match ends, Villarreal 2, Barcelona 2. Second Half ends, Villarreal 2, Barcelona 2. Attempt missed. Manu Trigueros (Villarreal) right footed shot from outside the box is close, but misses the top right corner following a set piece situation. Hand ball by Javier Mascherano (Barcelona). Attempt blocked. Bruno (Villarreal) left footed shot from outside the box is blocked. Attempt missed. Jeremy Mathieu (Barcelona) with an attempt from very close range misses to the left. Assisted by Lionel Messi with a cross following a set piece situation. Offside, Barcelona. Luis Suárez tries a through ball, but Neymar is caught offside. Attempt missed. Luis Suárez (Barcelona) right footed shot from the right side of the box misses to the right. Assisted by Javier Mascherano with a cross. Hand ball by Samu Castillejo (Villarreal). Attempt saved. Dani Alves (Barcelona) right footed shot from outside the box is saved in the bottom right corner. Manu Trigueros (Villarreal) is shown the yellow card for hand ball. Hand ball by Manu Trigueros (Villarreal). Mario (Villarreal) is shown the yellow card for a bad foul. Substitution, Villarreal. Leo Baptistao replaces Roberto Soldado. Attempt missed. Ivan Rakitic (Barcelona) right footed shot from the centre of the box is high and wide to the right. Corner, Barcelona. Conceded by Roberto Soldado. Corner, Barcelona. Conceded by Víctor Ruiz. Tomás Pina (Villarreal) is shown the yellow card for a bad foul. Substitution, Villarreal. Tomás Pina replaces Denis Suárez because of an injury. Attempt missed. Manu Trigueros (Villarreal) left footed shot from outside the box is high and wide to the left. Attempt saved. Ivan Rakitic (Barcelona) header from the centre of the box is saved in the bottom right corner. Assisted by Lionel Messi with a cross. Substitution, Villarreal. Adrián replaces Cédric Bakambu because of an injury. Sergi Roberto (Barcelona) wins a free kick on the left wing.